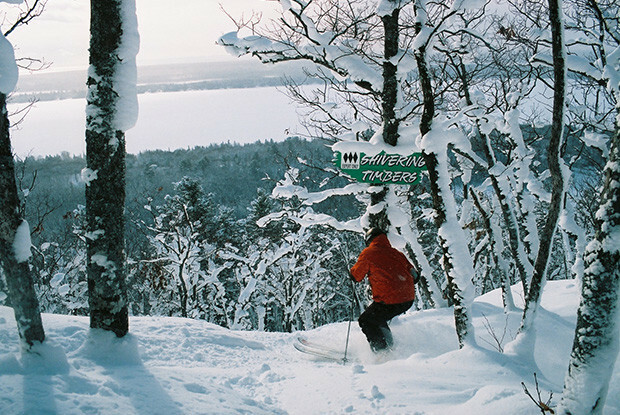 Mount Bohemia, nestled in Michigan's Upper Peninsula, prides itself on being an extreme mountain where the best can test their skills and abilities to the max. Mount Bohemia is a hidden gem that receives abundant lake effect snow and has the longest vertical in the Midwest. The terrain at Mount Bohemia is un-groomed and not suitable for beginners. Skiers and riders have access to 900 feet of vertical drop, 585 skiable acres, 2 lifts and an average yearly snowfall of 273 inches. Expert skiers can relish in the "Extreme Backcountry" section of the mountain, which provides a half mile wide forest with chutes and cliff drops. The resort boasts a "NO BEGINNERS ALLOWED" motto and pushes advanced skiers and riders with their legendary Apex and Horseshoe chutes. the resort also offers access to numerous backcountry glades. The ski area receives an average of 273 inches of annual snowfall a season with help from the lake effect snow. Mount Bohemia’s "Middle Earth" adds an additional hundred acres of great advanced to expert terrain.